If you are bored of the way the interior of your home looks but don't want to spend a lot of time and money buying new furniture or investing in expensive DIY projects, give your inner space a quick lift with a few simple tools and supplies. Like, chalk paint on a wall which you can then decorate, erase and redecorate with chalk. Or a splash of color by hanging fabric on the wall or adding a colorful floor rug in the living room. Or simply adding a vase of flowers, a glass bowl of fruit or several pots of houseplants (try the NASA-approved air-cleaning ones) throughout your home. Click on image to enlarge. 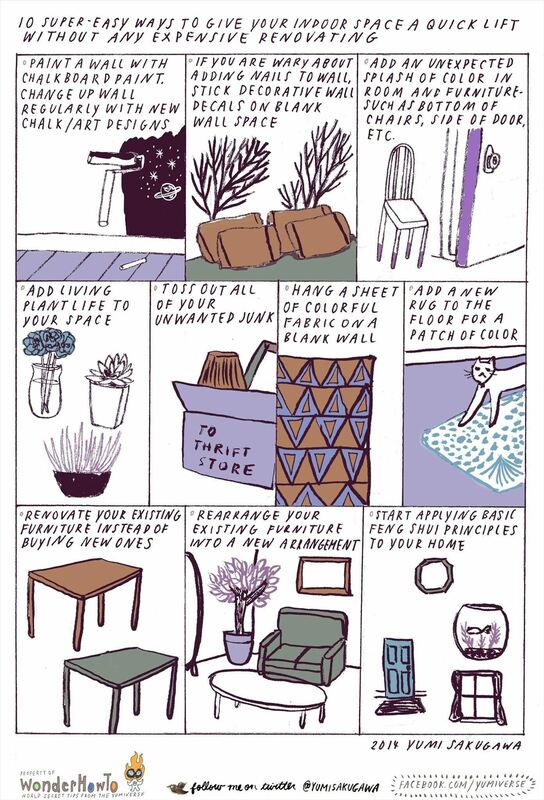 To spend even less money, simply rearrange the furniture you already have. Or even better, simply get rid of things you no longer need. You would be surprised by how new your home looks if you simply committed to getting rid to unwanted junk.